For some, the belief in the ability to tap into the spirit world in order to see the future, or get help with how to lead their current life, the Tarot deck is an invaluable tool. 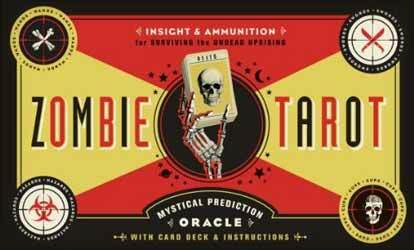 For the rest of us, with a bit of common sense, who realise you can't see your future in a pack of cards, Quirk Books gives us the amusing addition of this zombie tarot deck. The cards are beautifully presented, measuring 12 x 7 cm and having tongue in check '50s imagery with a zombie theme. There's also a useful, and amusing 98 page guide which offers help on how to use the deck - there's also some humorous '50s style ads. The origin of the Tarot deck was for the playing of various card games, only recently has it been used by those interested in the occult to channel the spirit world. Whether you are a die-hard believer in the supernatural, or a non-believer who happens to have a thing about zombies, this is a great release. Both tarot cards and zombies have been around for generations, and both are welcomed eagerly by enthusiasts - so here are the two combined. 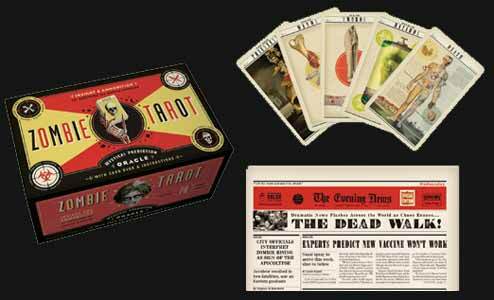 In a sturdy boxed set, all 78 cards of the tarot have been re-interpreted in line with the zombie apocalypse, with Wands becoming Shotguns, Pentagrams are BioHazard symbols, Swords are bladed weapons, etc. Fully functional, with original full-colour artwork for both Major and Minor Arcanda, and full and detailed instructions on how to perform readings the Zombie Tarot will appeal to any and all - zombie fans, tarot believers, pop-culture lovers, teenagers, horror fans, or those looking for an original gift idea.